One of the most significant factors in the last century that affect our inflammatory response in a multitude of ways is our consumption of Omega-6 and Omega-3. Our diet since the early 1900’s has become increasingly high in Omega-6 and low in Omega-3. However, most diets today contain at least 10:1, and up to 20:1 or even 50:1. The ideal ratio of these essential nutrients is 1:1. This high consumption of Omega-6, particularly from processed and hydrogenated oils, results in an exaggerated inflammatory response in our systems. Many try to improve this critical balance by following a healthier diet. However, in today’s world, this presents a huge challenge, as commercial fisheries and commercial cattle farmers use grain as the principal diet of their fish and animals, rather than the natural diet of greens. Such feeding results in low Omega-3 content in our food supply. Even if we reduce our consumption of processed oils in order to reduce our Omega-6 intake, it is difficult to get enough Omega-3 in our diets. 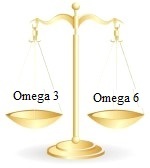 Therefore our Omega-6 levels further climb in relation to our Omega-3 levels. High Omega-6 is involved in increased inflammatory response. Omega-3 prostaglandins are important for the regulation and reduction of inflammation. Common inflammatory conditions include arthritis, pulmonary disease, lung cancer, rosacea, allergic reactions, MS, inflammatory bowel (IBS) and Crohn’s. However, inflammation is now also being implicated in such issues as insulin resistance in diabetes and obesity. Both Omega-6 and Omega-3 are required by our bodies, however, they must be in the correct ratio in order to be beneficial to our health. Fish oils provide Omega-6 and Omega-3 in ratios ranging from 6:1 to 14:1. Supplementing with a 1:1 Omega-6 to Omega-3 ratio animal-based product is desirable as it can quickly enable our bodies to restore our serum levels closer to the 1:1 healthy balance that our bodies need in order to function optimally. All three poly-unsaturated fatty acids (PUFAs) – EPA, DHA and DPA in the same ratio as found naturally in our bodies and in a form easily absorbed into our bloodstream, as found in Auum’s toxin-free and whole-food Omega-3 supplements are a “must try” for anyone looking to Omega-3 supplementation in order to improve or maintain their health.